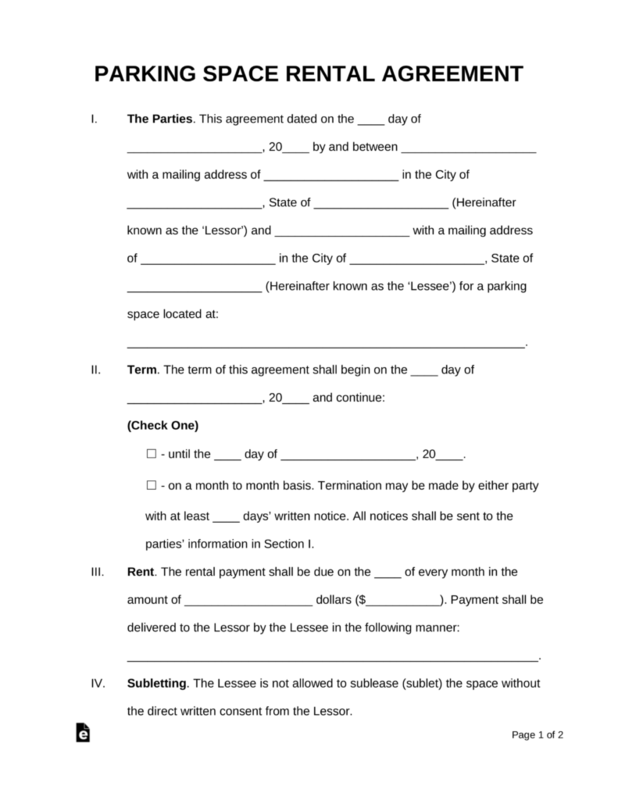 A Parking Space Rental Agreement is between a landlord that controls an area of space, designated for a vehicle, and allows a person to rent it in return for payment. Generally, there are limited State laws on this type of arrangement. The contract can either be set for a fixed term or on a month to month basis. The tenant shall only be able to store their vehicle (recreational vehicle, motorcycle, etc.) on the premises unless otherwise agreed to by the owner/manager. A person needing a parking space near their residential unit in a crowded city with limited parking. Someone who needs a parking spot in proximity to their work. This could be in a private parking lot belonging to another business. A couple with two cars that needs an additional parking space as they are living in a one bedroom apartment that only allows one vehicle. An agreement for the sole purpose of renting a parking spot is much similar to renting a property but much simpler. 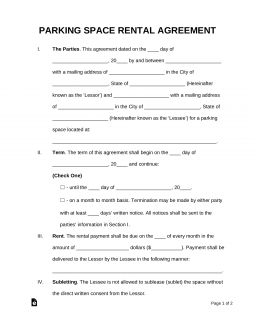 The individual renting the space from the owner, known as the lessee, must agree to the terms of the lease (either fixed or monthly) and the rent amount which shall be due on a specific day of each month. Much like a housing lease, the lessee may not sublease the parking space without the owners consent. The lessee is also responsible for the upkeep of the parking space and their vehicle including valid insurance and registration. No personal storage may be allowed in the premise of the parking space, the only object that shall contain the parking space is a vehicle or motorcycle in good repair. Most States have little to no laws regarding parking leases which makes it very easy to solve problems with regards to a tenant defaulting on a lease. If the lessee defaults, whether it’s due to unpaid rent or not keeping their vehicle in good repair, they can arguably be seen as trespassing on private property. That being said, all it takes is one simple call to a towing company and the lessee’s vehicle can be removed. However, it’s a good idea to warn the tenant prior to removal of their vehicle by placing a note on their windshield detailing the offense and outcome if the default goes unfixed.